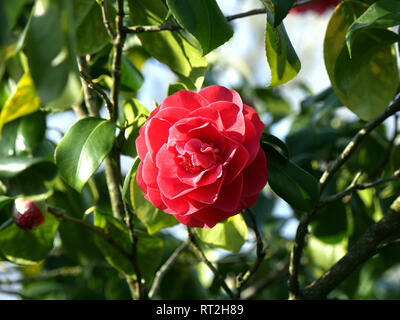 Agree with Bhandol, it's a Camellia japonica form. Technically it's a formal double with the rose form looser arrangement (some stamens showing). Unfortunately, there are quite a few of those around so I can't give you the exact variety. Thank you, brilliant as usual. You specify color, # of petals, leaf shape and very often it is bang on.